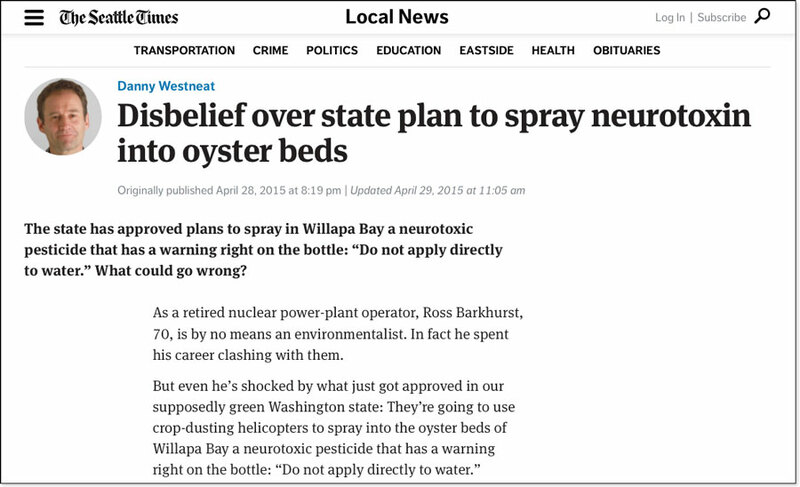 Many Coalition members and supporters are echoing the shock and dismay described in Danny Westneat’s April 28, 2015 Seattle Times article, Disbelief over state plan to spray neurotoxin into oyster beds. What can we do? The Coalition is consulting with experts about options, including filing an appeal with the Pollution Control Hearings Board. We will post updates as plans coalesce. April 9, 2018 No Imidacloprid Permit-You Saved Willapa Bay!! Our Coalition is excited that finally Washington regulators are not allowing more Washington native species to be destroyed in order to expand shellfish exports. Many thanks to all of you who helped us!! SOUTH BEND – Shellfish growers from Willapa-Grays Harbor Oyster Growers Association requested a permit from the state to use the pesticide imidacloprid on oyster and clam beds to control native burrowing shrimp. After thoroughly evaluating the request, the Washington Department of Ecology has determined that the environmental harm from this neonicotinoid pesticide would be too great. Therefore, Ecology is denying the request for a permit. May 7, 2015—It is important to note that pesticides (in particular Imazamox, aka Raptor) are still in use in Willapa Bay and elsewhere in Puget Sound region shellfish aquaculture. Imazamox is classified by the National Institutes of Health as “very toxic to aquatic life with long lasting effects.” The Coalition’s position is clear—no pesticides in our shellfish! May 4, 2015—First Taylor Shellfish, and then the Department of Ecology, have backed away from this plan. The permit to use these dangerous chemicals is canceled as of May 4, 2015. This is indeed a victory, and demonstrates the power that we have as citizens, when our voices come together. But this is also the tip of the iceberg with regard to environmental damage caused by industrial aquaculture practices. The Coalition is at work today to effect deeper change in the Puget Sound region. Monday, May 4, 2015, noon to 2:00 p.m.
We need your help to stand against this deeply foolish decision. Please give what you can. Cliff Mass has an excellent article on his blog: Oysters and Pesticides: The Washington State Department of Ecology Stumbles. More from Seattle Times: Chefs ‘horrified’ by plan to spray pesticide on oyster beds.